Sant Pau is a one of the most prestigious culinary establishments of Spain. 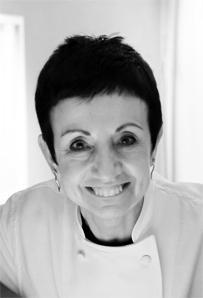 Behind the three starred restaurant Sant Pau, stands an ingenious Alpha female called Carmen Ruscalleda! Try saying it, it sounds wonderful. So is she. Warm and grateful for your visit, she will earn your respect the minute she comes to your table. During the day of visit, she came out of the kitchen to greet her guests at the end of the meal, with a genuine smile. Our request for a photograph was well received, as she gave us a courteous hug for the perfect shot! Carmen Ruscalleda found nothing ready. She built everything from scratch. She started the restaurant with her grocery owner husband in 1988, slowly making it the luxurious establishment that it is today. She really came a long way. Carmen leaves nothing to chance when it comes to her work. Her dishes are meticulously detailed, with no fancy appearance tricks and no surprises. Her food is traditional Catalan with basic items such as beans, but done in an extraordinary manner. She is also head chef at Moments Barcelona and manages Sant Pau de Tòquio in Japan.